And apparently, he was speeding. In an Audi TT. Actually, what really seems to be happening is that there’s a British driver speeding past cameras in Bavaria. But since he (or she) is British, his (or her) steering wheel’s on the wrong side of the car, so that the cameras, which are set up to catch the driver’s side of the car, are actually catching the passenger’s side. Which would be neat enough, because if dude (or dudette) left it as it was, those crazy Kraut police would be trying to slap the invisible man with some speeding tickets. But no. 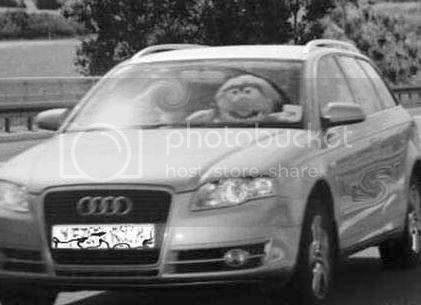 Because dude (or dudette) is awesome, and instead of just letting the cameras capture an empty passenger seat, he (or she) is driving with a freakin’ Muppet!. I would totally pay real, cash money to see a cop pull said car over and then approach the window only to find himself talking to a Muppet. I wonder if the driver (or driverette) is also taking advantage of the carpool lane. But, like, one would never expect, say, Gonzo or Scooter to be speeding. Because, of course, Scooter would be riding a scooter. ‘Cause that’s how he rolls. I’m surprised you didn’t also post that picture of the rest of the cosmic mayhem band freebasing with Keith Richards. I mean, it was a big story when it first came out.